Hillary Clinton won Issa's district by 7 points over Donald Trump in 2016.
camera (Andrew Kelly/Reuters) Representative Darrell Issa (R-CA) enters Trump Tower in Manhattan, New York on Dec. 14, 2016. 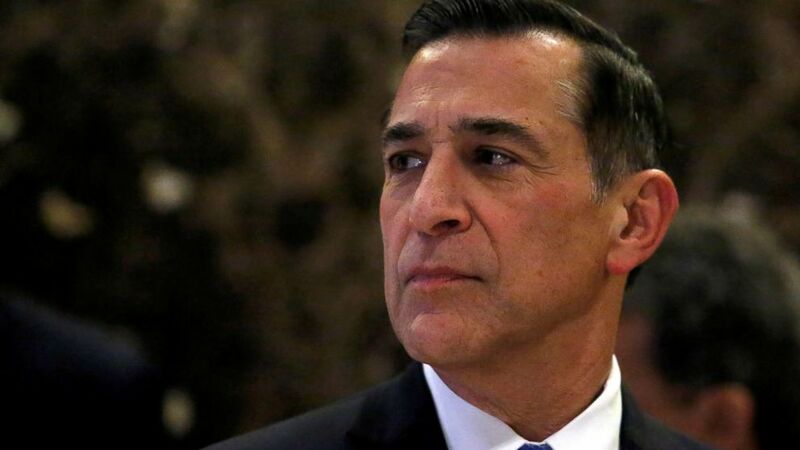 Rep. Darrell Issa, R-Calif., will not seek re-election to his Orange County congressional seat, he announced Wednesday, the latest in a string of retirements from Republican House members in recent weeks. Issa was first elected to the House in 2000, and served as chairman of the House Oversight Committee from 2011 to 2015. “I am forever grateful to the people of San Diego, Orange and Riverside counties for their support and affording me the honor of serving them all these years,” Issa wrote in a statement Wednesday. “While my service to California's 49th District will be coming to an end, I will continue advocating on behalf of the causes that are most important to me, advancing public policy where I believe I can make a true and lasting difference, and continuing the fight to make our incredible nation an even better place to call home," he added. Issa’s announcement comes just a day after another high-profile Orange County Republican congressman, Ed Royce, announced that he too was retiring in 2018. Issa’s decision makes him the 30th Republican House member to not seek re-election this year, a number that has steadily grown in the last several months. Of those 30, 11 are seeking a U.S. Senate seat or the governor’s mansion in their respective state. Districts like Issa’s are key for Democrats to take back the House in 2018, and the party was quick to capitalize on the news of his departure. “Secretary Clinton won this district by a huge margin in 2016, and the cohort of strong Democratic challengers, unprecedented grassroots activism, and historic investment by the DCCC in Southern California means we are in a strong position to elect a Democrat to the 49th District this fall,” Drew Godinich, a spokesperson for the Democratic Congressional Campaign Committee (DCCC), wrote in a statement Wednesday. The National Republican Congressional Committee expressed optimism that the seat will remain red.